Air barriers have been discussed and used in different ways since the 1930s. The purpose of an air barrier is to limit uncontrolled air leakage into and out of the building’s envelope. A building’s envelope is defined as roof, wall, and floor area that encloses a heated or cooled area. Uncontrolled leakage will result in increased energy usage due to the heat or cooling lost. In the 1930s, the University of Minnesota did a study on leakage through framed walls, resulting in the first acceptance and use of paper weather barriers. Unfortunately, over the next 7 decades, the concept and proper use was lacking in building science and training for contractors, resulting in many building failures. In the 1970s, however, an oil embargo led to the construction industry becoming more focused on adding insulation and vapor barriers in order to conserve energy. Air leakage is sometimes called infiltration, which is the unintentional or accidental introduction of outside air. Humid climates will have warm, moist air moving into the building envelope through leakage and door passage. In the winter months, this can result in moist indoor air moving into the envelope cavities, which can lead to condensation that may damage the insulation and further impact the performance of the building envelope. Infiltration is caused by wind, stack effect, and mechanical equipment. Wind creates positive pressure on the windward side, and negative pressure on the leeward side, which can lead to infiltration. Stack effect refers to warm air rising in the winter and leaking at the roof/ceiling area, as well as cold-air infiltration at the lower areas of the building—namely, around passage doors, overhead doors, and windows. Mechanical equipment moves air within the building, which can generate positive and negative pressure differences if the air is not properly exchanged. All of the aforementioned requirements of the ASHRAE 90.1-2010 and IECC 2012 must be met, but building designers have some options on how to comply with these requirements. The building designer will make the choice as to which route he or she will take for compliance. There are 3 ways to comply with the Air Barrier Standard: (1) Assembly; (2) Whole Building; or (3) Materials. The assembly option is one of the more involved routes to take, and, depending on type of construction, can be difficult to obtain. 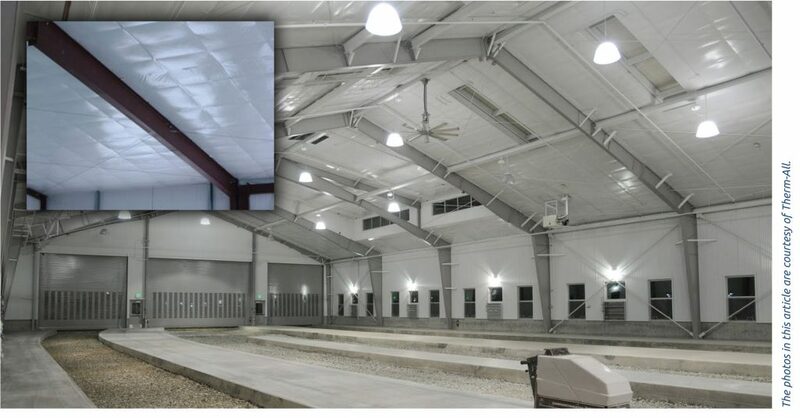 Metal buildings may offer an easier road to compliance in the assembly option due to the simplified construction of these buildings. Metal building roof and wall design is fairly standardized and has remained unchanged for many years. The Metal Building Manufacturers Association (MBMA) worked with the National Association of Home Builders (NAHB) to conduct a series of air infiltration tests to evaluate the air-sealing effectiveness of various metal building wall insulation systems. The recorded results were well within the required leakage levels. Conventional-type buildings may be a little more difficult because of the varying types of wall and roof assemblies. IECC and ASHRAE both have a list of materials that can be used as the air barrier. However, the work does not end at merely selecting a material—the proper joining of the materials is necessary, and requires careful attention in the field. In addition to the list within these codes and standards, any material tested with an air permeance ≤ 0.004 cfm/ft2 under a pressure differential of 0.3in w.g.—also known as ASTM E2178—can also be used as the air barrier. This process can be a little complex, as some air barrier material suppliers have recommended procedures for joining their products, while others do not. There is also a lack of training and a deficit of instructions for these products in the field. Similar to the other approaches, metal buildings may offer an easier path due to their simple, standardized construction. In conventional construction however, the designer is in the position of tying together many different types of construction and air barrier materials within different types of construction. In this circumstance, it is always advisable to hire an air barrier consultant. They can look at all the types of construction and air barrier materials, and detail the joining of these areas. All plans must be minutely detailed on the drawings, or they will not be built properly. All fenestrations of a building envelope also have requirements for air leakage. See Figure 1 for the test procedures and allowable leakage. 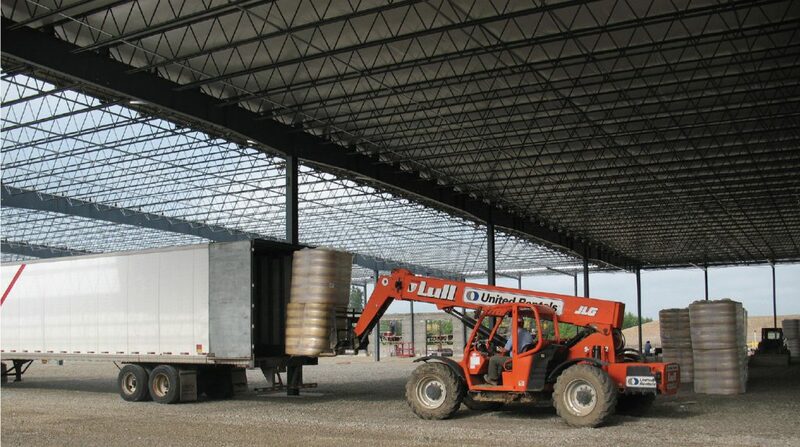 Metal buildings are estimated to make up around 40% of all low-rise commercial construction and have a simple basic design that allows many options for code compliance. 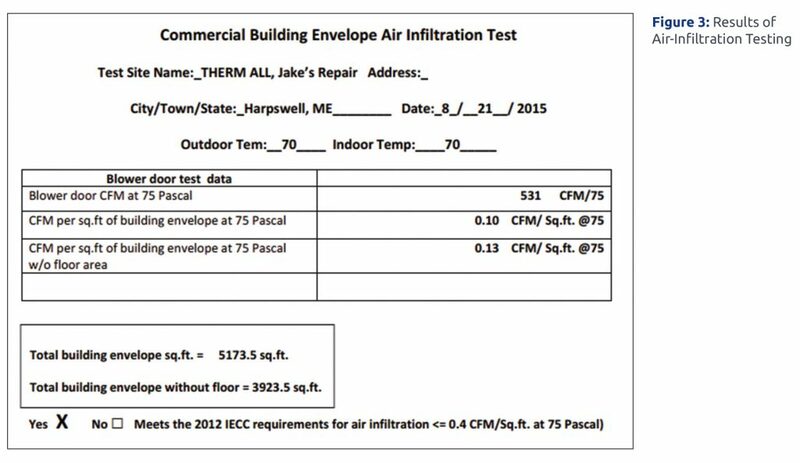 In August 2015, Therm-All Insulation, a metal building laminator company, did some testing of a metal building in Maine, with remarkable results. Figure 2 depicts a metal building undergoing testing and Figure 3 shows the test results. During the same time period, Therm-All also tested other metal buildings and found that meeting the 0.4 leakage can be difficult. As the future of code cycles change, the air barrier requirement will only increase in terms of required performance. The location of the air barrier is important and may vary depending on the type of construction. There are 3 basic options for the locationof the air barrier in metal buildings: First is the interior of the envelope (vapor barrier), second is the exterior of the envelope (metal siding), and third is somewhere in the assembly. 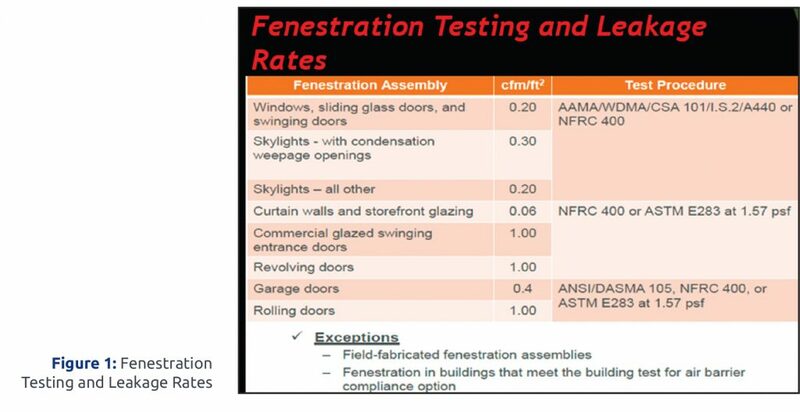 Therm-All focuses their testing and construction on the third option, since the life span of the air barrier is longer and is less likely to fail—as shown in the strong test results above, it offers many advantages. The first interior option has many vulnerabilities based on its exposure to other trades, and damages from day-to-day operations from occupants. The second exterior option is vulnerable to damage from movement, as any air-sealed exterior product is at risk of failing over time as the building moves. It is important to take leakage and the in place U-Value of the envelope into consideration when designing a building’s mechanical systems. Oftentimes in construction, there is no communication between those responsible for envelope design and those responsible for mechanical systems. This needs to change in order to yield the best final results: a building that uses less energy and operates at maximum efficiency. This article was published in the February 2016 issue of Insulation Outlook magazine. Copyright © 2016 National Insulation Association. All rights reserved. The contents of this website and Insulation Outlook magazine may not be reproduced in any means, in whole or in part, without the prior written permission of the publisher and NIA. Any unauthorized duplication is strictly prohibited and would violate NIA’s copyright and may violate other copyright agreements that NIA has with authors and partners. Contact publisher@insulation.org to reprint or reproduce this content.